Donna Reish, blogger, author of over 100 language arts/writing curriculum books, and Intermittent Fasting teacher, inspires listeners by reminding IFers how they become true “managers” of their lives through their success with this lifestyle. She explains that while we have many areas of our lives that are out of our control, the body balancing and empowerment that comes through IF helps us to be able to manage our lives like never before. She first describes how Fat Adaption and Appetite Correction make it easier for us to stick with fasting—and this control over food (sometimes for the first time in our lives) gives us layers of self control that we never knew we could have. Donna explains how success breeds success in our lives—and especially in an area as challenging as food control. She describes the self confidence that comes from weight loss and size loss, especially when it comes about from something that we can honestly do forever (not a diet or quick weight loss plan). Donna explains the many health benefits that come from simply doing “nothing” in a world in which we are faced with challenges and pleas to do “everything perfect” in order to achieve health. MARCH FREE IF WEBINARS—Choose the Date/Time That Works for You! Do you long to manage your weight while still enjoying birthday parties, weddings, showers, family dinners, and other special occasions? Do you wish you could meet your fitness goals while still enjoying social events and nights out to your favorite spots? Do you love to vacation and enjoy the local cuisine without guilt? What about health…..have you heard the amazing health, anti-aging, longevity, immune-boosting, muscle-restoring, and disease prevention benefits of Intermittent Fasting? Donna Reish, Intermittent Fasting blogger and author, tackles the subject of building belief in yourself and Intermittent Fasting through the teaching of James Clear, author of upcoming book, Atomic Habits. Donna starts out asking listeners to think back to something that they have done consistently, something that they have been successful at. Then she builds on that to explain that we are successful at something when we take it on as our identity. We are consistent then we succeed. It becomes US, who we are. She then applies this to weight management endeavors. Many of us were not successful because we didn’t have our bodies working FOR us to help us build the habits that it takes to be successful with weight management and fitness. Donna then explains a two-step process that Clear teaches in his articles and videos—that of taking on the identity of who or what you want to become and THEN applying TINY habits that support that identity. She explains how we can do this with Intermittent Fasting, exercising, and other habits that may have eluded us before we became fat adapted and developed balanced hunger hormones. Everything is different now with IF—and we can be exactly what we want to be—even something that we previously never thought possible! In this episode, Donna explains four ways we lose pounds and inches with Daily Intermittent Fasting, focusing on how three of the four of these have to do with the FASTING window (not necessarily the feasting window). She encourages listeners to not just consider pound loss when Intermittent Fasting, but to also consider inch loss and the effect that has on how we look and our clothing size (and ultimately how we feel in our clothing). The first way we lose is that we become “fat adapted” through fasting. This is when the body becomes a “fat burner” rather than a “sugar burner.” This way is influenced by the fasting window. The second way we lose is that muscle is retained while fat is burned, causing inch loss. This happens as Human Growth Hormone is increased between 500 and 2,000% during the fasting window. This way is also based on the fasting window. The third way we lose weight is that a shorter eating window AND balancing of hunger hormones cause us to make a small calorie deficit during our eating window that causes pound loss over time. This happens during the eating window, but is influenced by the fasting window/balancing hunger hormones (ghrelin and leptin). The fourth way we lose is through the boosting of metabolism that happens during Intermittent Fasting. This metabolism boost has been shown in research to be up to 12-14 percent from fasting. This weight loss mechanism is most affected by the length of the fast. Donna encourages readers to grasp what our bodies can do FOR us during Intermittent Fasting, rather than what we might have historically thought about our bodies when it felt like they were working AGAINST us. Donna Reish, author of Donna’s Intermittent Fasting Course, blogger, and IF teacher, teaches how to get started with Intermittent Fasting with this episode of IF Primer. She gives steps for starting, including understanding how we lose weight and inches with IF, choosing your IF protocol, deciding on speed of starting for yourself, and planning your fasting window and feasting window. Donna introduces the various protocols of IF and how they affect weight loss, food in your feasting window, and how they put you into fat burning sooner or more frequently. She encourages listeners to start at the pace that they desire–quickly with more hunger at first but white knuckling through the first two weeks until your hormones are balanced and your body is trained to burn its own fat or slower with fewer hard days at first (but taking longer to get into fat burning). Donna also emphasizes the importance of planning your time during the fast and planning your food during the eating window so that you create that calorie deficit that is needed (but not so drastic that you are not able to keep your fasting hours). 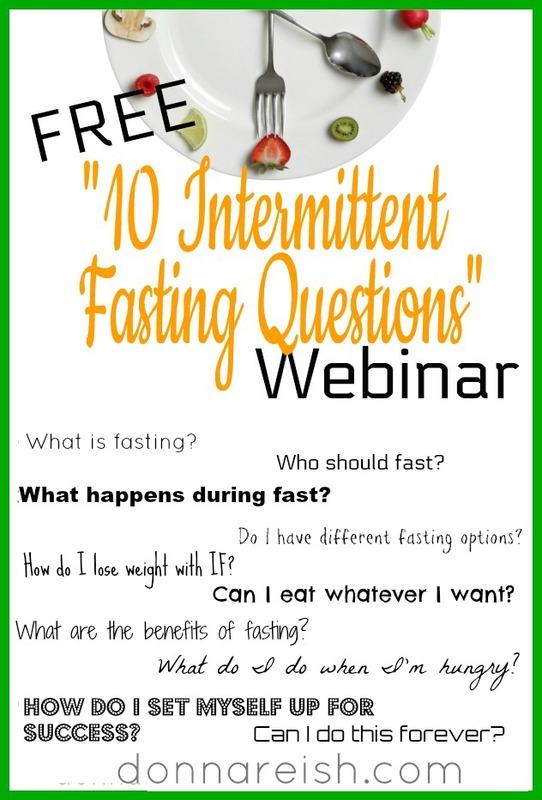 She reminds listeners to get her free Intermittent Fasting Start Up Charts, to read about how to fast well at her blog, and/or to sign up for her upcoming IF Course. In this broadcast, Donna Reish (IF blogger, curriculum author, and course creator) gives her and her husband’s seven month IF update (70 pounds between the two of them and many sizes!). She describes their OMAD/3 (One Meal a Day divided into three parts—SED—Snack/Entrée/Dessert) as well as how they open their eating window. Donna then briefly reviews last week’s info on 7 Ways to Lose Weight Faster With Intermittent Fasting (fasting longer, OMAD/3, Fasting Spectrum, reducing carbs somewhat, keto diet, exercise, and counting calories). She moves into more weight loss helps and tips and describes the effect of each one on the Intermittent Faster: drinking coffee, sleeping longer/better, consuming water, keeping truly busy, taking 5 HTP, and filling the stomach with fiber! Donna’s sponsor today is her beloved Accelerator—with caffeine, 5HTP, yerbe mate (appetite suppressant), and more!